A look back on my trip to The U.S.
Futsal is gaining momentum in the U.S. and I was recently there to work with one of the organisations involved in developing the sport, USA Futsal. In the first part of this post I will explain a bit about USA Futsal. In the second part I will discuss how fans’ enjoyment of futsal can be increased through learning from the example of professional sport in The U.S. as well as improving the audience’s knowledge. The main purpose of my visit was to help organise The World Futsal Championships that takes place in August in Orlando, Florida. This is an international tournament for all age groups in both female and male categories (still a few places left, apply at USAFutsal.com) and will feature a unique exhibition game, The PFL All-Star Showcase, between Falcao and Ricardinho. This tournament is one of several premier futsal events and programmes that USA Futsal organises, mainly catering for youth players and teams. They have included elite level events as well such as the 2013 Intercontinental Cup which featured the top pro clubs worldwide. The World Futsal Cup is a youth tournament they organise in Barcelona every December for boys and it always attracts big names such as FC Barcelona, Benfica and Corinthians. They have the Elite 96 programme which are youth training camps held during the summer with leading professional futsal players and coaches. The best players are selected from there for the Top XII teams that go on tour to Spain (see video below). In May they held the first ever public schools futsal tournament which was a huge success. I organised sessions in a school to introduce futsal to the students and the reaction was fantastic. They really took to it and I think the fact it is fast with lots of action makes it is a more suitable for their sporting culture than 11-a-side football. I also educated coaches and P.E. teachers on the fundamental tactics of the sport and they were very interested in this. The similarity to basketball meant the had an immediate understanding of the tactical strategies. The idea is now to replicate this programme across the country as schools are key to spreading futsal and growing the numbers playing. The reason I choose to work with USA Futsal is all of their programmes and events present futsal in an authentic and high quality way. They realise the importance of always providing a premier futsal experience rather than a weakened down version. This creates lifetime futsal fans and players. 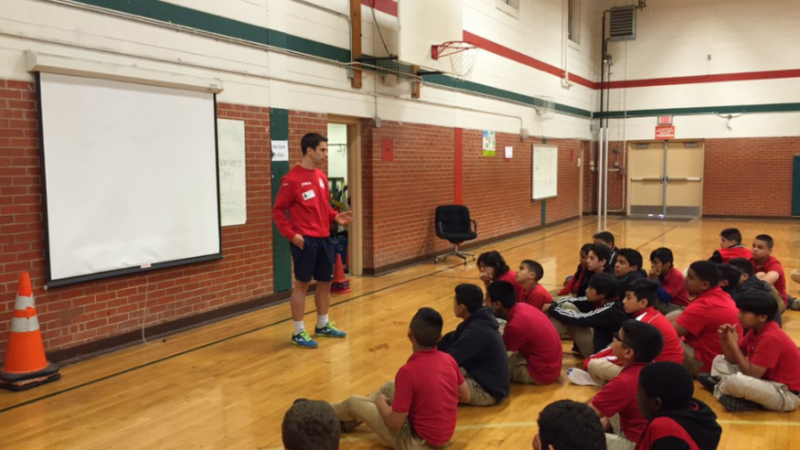 Introducing players & coaches to futsal at a school. The growth in The U.S. at the grassroots level over the last few years has built nicely to the announcement that there will be a professional league in the USA, called The PFL, that is due to start in 2018. While I was there I was able to get a closer look at the developments happening within The PFL and I believe it will have a huge impact on the future of futsal. This is something I will report on later in the year, after the World Futsal Championships. During my time in the USA I was fortunate to go to the Dallas Mavericks’ NBA games with VIP access. 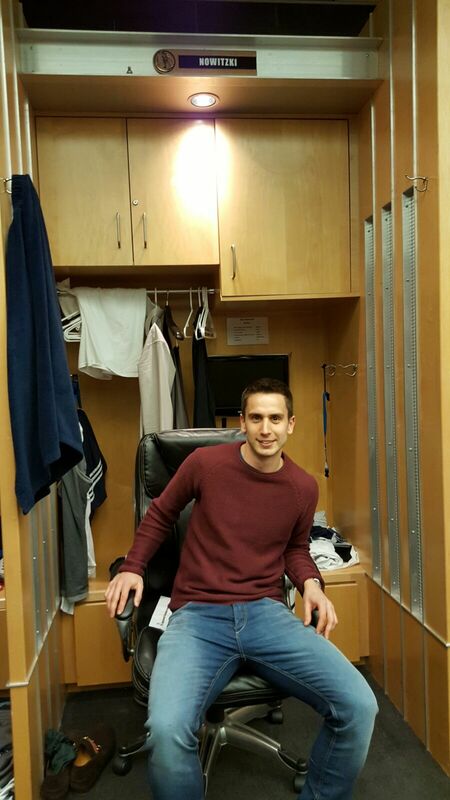 Just as the game started we would have a quick tour which included visiting the changing rooms and I got to sit in the seat of NBA legend Dirk Nowitizki. Following that we went to the facility’s practice court where the players do their pre-game warm up before heading to the stands to take in the match. Watching these games I saw how they create a show for the fans. Though nearly 3 hours long, a relatively long time to what I am used to, they ensure you are entertained throughout. Taking place in an indoor arena means a lot of what they do has relevance to futsal. In Europe the best you can expect for entertainment outside of the actual game is cheerleaders or dancers during the breaks. In the USA the spectacle has evolved much further. Every break in the game, and basketball has many, there was something different, often with a prize from a sponsor up for grabs. They even made a simple game of ‘Simon Says’ very captivating. I witnessed a NBA Development League game where the NBA feeder teams compete. The way they do the event was very interesting. In the arena at one end, just behind the basket, they had a bouncy castle and inflatables and at the other end there were kids dribbling basketballs and playing with hula hoops. The concourse had other things to keep people entertained. The arena was full of people but only a small proportion were actually sitting in the seats following the game. As a futsal purist I have to say I wouldn’t be comfortable with the game being almost a side issue but it helps get people in the arena and stay there for longer. This results in more money being spent and that makes the team feasible. It is now established that professional sport is part of the entertainment industry, competing with the numerous other options fighting for people’s limited free time. Sports organisations have become more aware of this and work to increasing spectators’ enjoyment but this is not only about filling in the breaks in the game. What captivates people is the same regardless of the type of entertainment. There needs to be a narrative that you become immersed in. To achieve this the audience need to understand the characters and their backgrounds, the different conflicts and values. Ideally there will be unexpected plot twists and a dramatic ending. This creates tension and emotional investment in what is happening, the key to being entertained. Anyone who watches futsal will be able to recall games that were completely enthralling and you couldn’t look away from for a second. It is amazing how often they finish in dramatic fashion. Plus futsal has the added interest of a contest with opponents using different strategical approaches and tactics which stimulates debate. When you know the history and background around any contest, even when there is little action, it can still be entertaining. If there was a football match where there wasn’t much happening it is much more interesting if it is Barcelona v Real Madrid than an identical game between two teams no-one has ever heard of. Sometimes narratives are even manufactured to sell an event such as boxers who are ‘supposed’ arch rivals before a fight and then good friends after. Unfortunately, many people don’t have the exposure or knowledge of all the surrounding information around futsal games to get caught up in the story. I tried to address this when commentating for Eurosport, discussing the teams, players and tactics to an audience where the majority would have been futsal novices but there needs to be a more widespread sources of this type of information. The lack of futsal coverage results in a lack of knowledge and vice versa, reinfocing each other. We have to break this cycle. Getting the traditional media to report on the sport is notoriously difficult but today people get their information from various sources and content is easy to produce and distribute. We need to think how to increase fans’ background knowledge to engage them. Simple things like a fantasy futsal competition can increase familiarisation of the players. I am really looking forward to attending the next big event in U.S. futsal with The World Futsal Championships and PFL All-Star Showcase in August where there will be top talent from youth to senior level, both female and male. The PFL will give all these players getting involved in futsal a platform to aim for where they can display their futsal skills to a wide audience, and it will increase the opportunities for a professional career in the game. With the game growing quickly at both the grassroots and elite level, the next few years will show whether futsal will become a prominent sport in The U.S.. This is a key region to increase the game’s following and will be a crucial part of it’s development. Futsal is approaching a decisive moment in its history and I am very excited about its future. 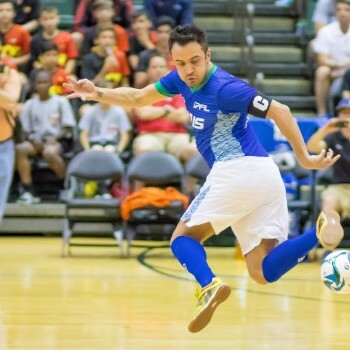 Futsal is a fast growing sport in the U.S. Despite soccer’s rising popularity as seen by the numerous additions of teams to MLS (4 in the last two years), I have argued for many years that Futsal is actually a better fit for this market. From the casual fans viewpoint, the one lasting complaint of soccer here continues to be the lack of scoring. From the marketing viewpoint, soccer doesn’t provide enough built-in breaks to allow for the promotion of products that are vital to making sports successful in the U.S. The big three sports, baseball, basketball, football have built-in breaks in varying degrees which make it very easy to sell ad time to companies wishing to promote their products. Futsal solves both of these problems. If Futsal added two timeouts per half, it would be the perfect sport for this market. Not that I really like that idea as much, but if it would help promote the sport, I would be in favor of it. Additionally youth participation is growing at a large rate. While I don’t have data to back that up, it is obvious to see the number of teams that now participate in over 10 regional and one national youth championship tournament as well as the fact that the country now has Futsal identification camps nationwide and national teams at almost every age level. Futsal is a perfect sport form any northern states where it is not feasible to play outdoor soccer. It can be played on a basketball court and those are abundant in the U.S.